A move that will give ranchers an extra wage of Rs 62,635 crore and help contain their stewing discontent over high info cost and low deals acknowledgment.The Cabinet Committee on Economic Affairs (CCEA) headed by Prime Minister Narendra Modi endorsed higher least help value (MSP) for winter-sown or Rabi crops. The choice will enable agriculturists to win an extra wage of Rs 62,635 crore, Law Minister Ravi Shankar Prasad told columnists here after the gathering. The choice comes quite close to declaring higher cost for Kharif crops, when the administration satisfied its guarantee of giving agriculturists 50 for each penny more cost than their expense of creation. 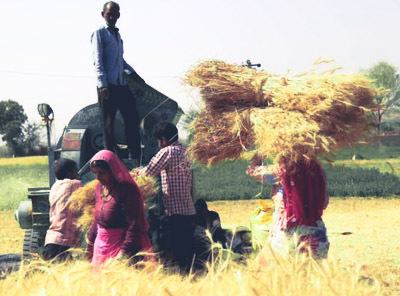 The Cabinet has endorsed a Rs 105 for each quintal climb in wheat MSP to Rs 1,840 for 2018-19 season, Agriculture Minister Radha Mohan Singh said. The MSP of wheat was Rs 1,735 for each quintal in the 2017-18 trim year. Singh said the MSP for all Rabi crops is higher than the expense of creation extending from 50-112 for each penny. According to the CCEA choice, the MSP of grain has been expanded by Rs 30 for each quintal to Rs 1,440 for every quintal, while that of gram (Chana) by Rs 220 for each quintal to Rs 4,620 for every quintal. Masur's MSP has been raised by Rs 225 to Rs 4,475 for each quintal, while the help cost of rapeseed/mustard has been climbed by Rs 200 to Rs 4,200 for every quintal. Safflower MSP has been expanded by Rs 845 for each quintal to Rs 4,945.The help cost has been expanded in view of the proposals of homestead warning body CACP (Commission at Agricultural Costs and Costs) and is in accordance with the administration's declaration to give ranchers a 50 for each penny benefit over the expense of generation.